TOYOTA GAZOO Racing World Rally Team enjoyed a strong Saturday on Rallye Monte-Carlo. 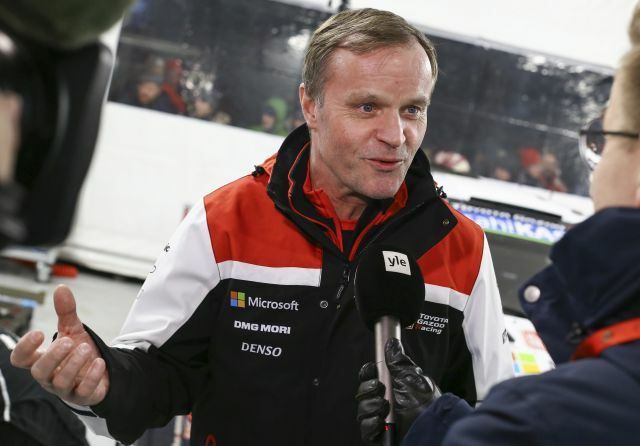 Ott Tänak won all four stages, and the Toyota Yaris WRC posted the two quickest times on every test. Jari-Matti Latvala is in 2.3 seconds of a podium position going into the final day, with Tänak a further 15s behind him in fifth, while Kris Meeke is also in the top six and continuing to enjoy his debut with the team. The second leg of the rally consisted of two loops of two stages north of the service park in Gap, with conditions on the road varying from snow and ice to dry asphalt. On the day's first stage - the longest stage of the rally - Tänak and Meeke were separated by only 0.4s. Meeke was also second-quickest on the two stages that made up the afternoon loop. Latvala had been second-fastest on the day's second stage, which moved him up into third position. He moved back to fourth place in the afternoon, but remains close to his rival with four stages remaining. In the afternoon, Tänak was the only World Rally Car driver to opt for winter tyres without studs, and his ongoing speed brought him closer to the podium battle, fighting back from the time lost changing a wheel on Friday. “It has been an excellent day for all our drivers. Ott and Kris especially were consistently fast throughout the day, and in Ott's case, he was quickest of all on every stage. “It's been a good day today: a normal day in the office. This afternoon we did something a bit different with the tyres compared to the others to try and gain some more time. In the end we gained a little bit, not much, but every bit helps. Thanks to my gravel crew who pushed me to do something different, because it paid off. “It's been a great fight with Sebastien Loeb over third place today. At first he was ahead, then I was ahead, and now he's ahead again, but the gap is very small. I was hoping that I could have kept him behind, but when the conditions were mixed, I was maybe not so strong. “Even though the conditions were tricky, I really enjoyed it today. The Yaris just seems natural to drive, it does what you want. I'm gradually building in confidence. We were really close to Ott's times on a couple of the stages: Over 30 kilometres of snow, ice, greasy, slippery conditions there were only a few tenths of a second in it, so I'm happy to be there or there about already. After this evening's final service, the crews drive their cars to Monte Carlo ready for the final day of action in the mountains above Monaco. Two stages will each be run twice – one of them featuring the iconic Col de Turini, and the other serving as the rally-ending Power Stage with bonus points on offer.